Critical environments can have a variety of layouts depending on the purpose of the space. Frequently, these critical environments will have a multi-room setup. Some examples of a multi-room setup are an isolation room and anteroom or a cleanroom, gown up room, and clean storage area. Room pressure monitors are an integral part of any critical environment design, including those with multi-room layouts. However, installing individual room pressure monitors in each space of a multi-room critical environment has significant drawbacks. A room pressure monitor in each area of a multi-room setup quickly becomes expensive. It is also intrusive, as installation disrupts regular operations, and installing so many room pressure monitors dirties a space with dust from cutting holes into walls. Having the ability to monitor all the spaces within a multi-room setup from a single screen eliminates many of the drawbacks previously mentioned. 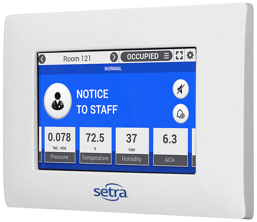 Setra FLEX can be configured for up to 3 rooms and monitor up to 6 parameters for each room. 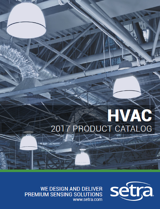 This brings the data for a space into a single location and minimizing the pains associated with cost and installation. FLEX can be networked into the building management system (BMS) or building automation system (BAS) via BACnet and serve as a hub for all the local environmental sensors.